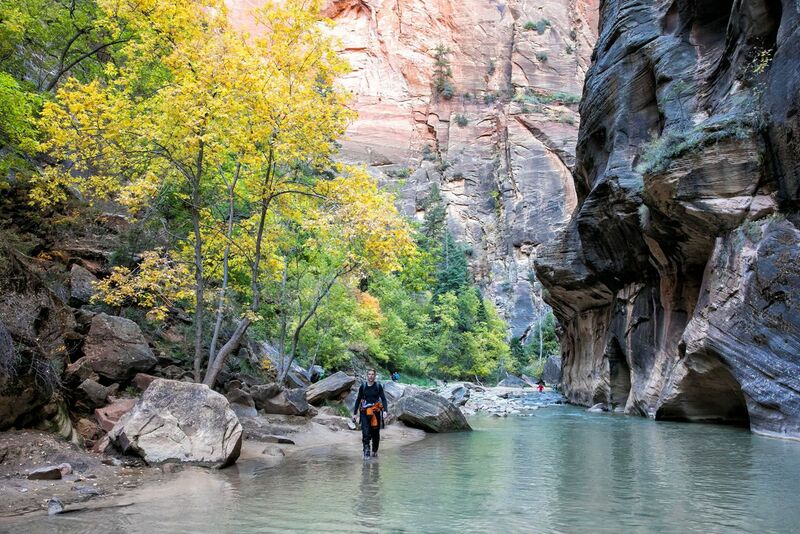 Hiking the Zion Narrows is a very unique experience. 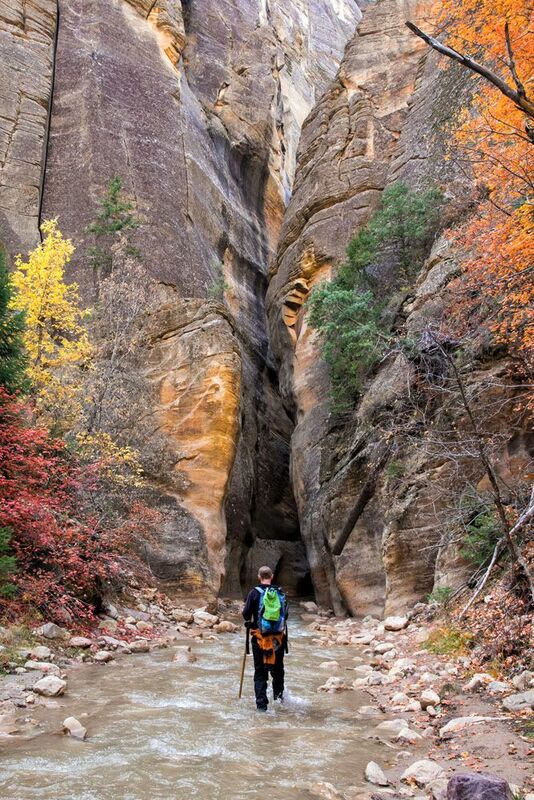 For miles you hike through an endless slot canyon with the North Fork of the Virgin River as your hiking trail. 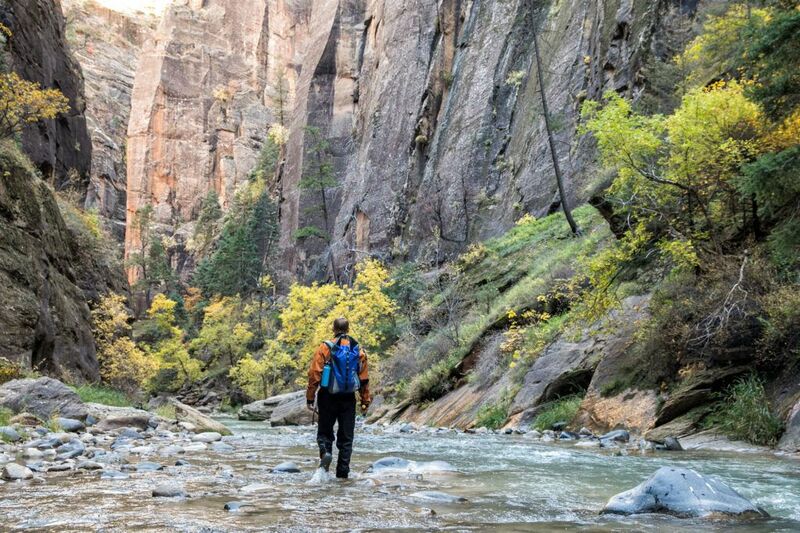 There are two ways you can hike the Narrows. Most people hike it from the bottom-up, an out and back journey that takes you through some of the most scenic sections of the canyon. Or, you can hike the entire length of the Narrows along the top-down route, an epic experience that can be done as a massive one day hike or as a two day backpacking trip. 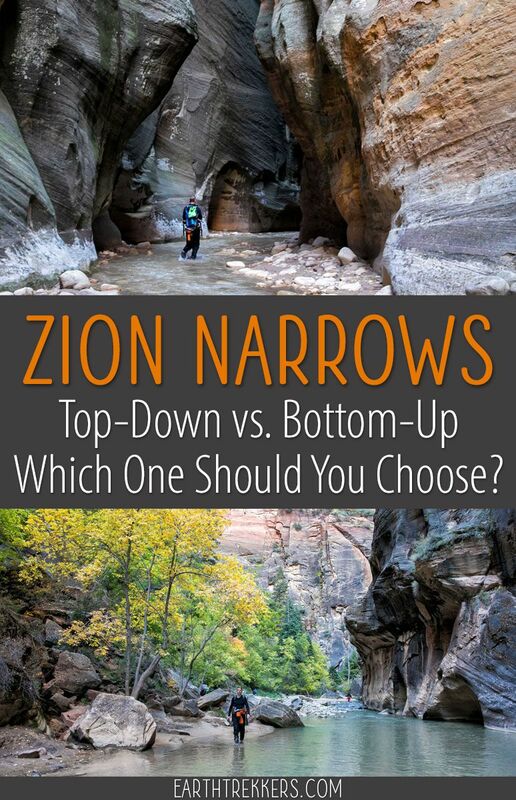 Of the two routes to hike the Narrows, top-down vs. bottom-up, which one is best for you? 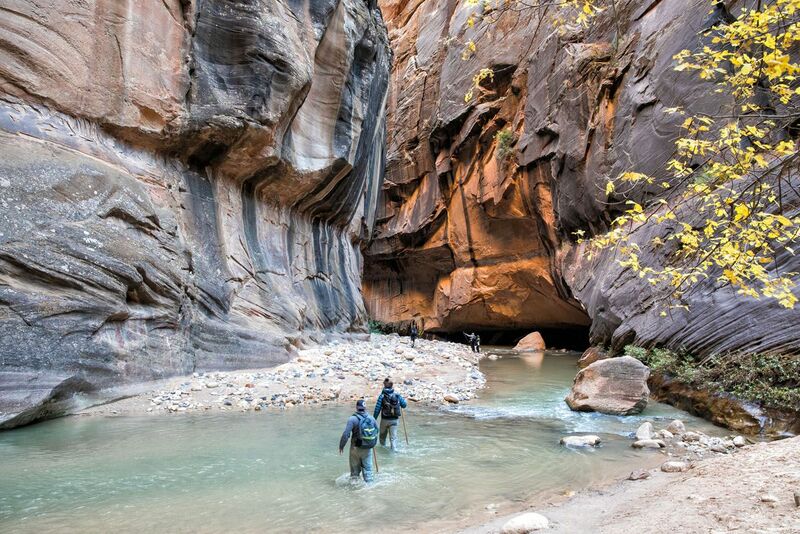 This is the most popular way to hike the Narrows. Starting at the Riverside Walk, you hike upriver for several miles and then turn around and hike back the way you came. Along the way, you get to see some of the best scenery in the Narrows, including Wall Street. Wall Street is the iconic section where the canyon gets very narrow and the sheer rock walls close in overhead. It’s an awesome sight to see. From the bottom-up, the farthest you go is Big Springs. Beyond this point, a permit is necessary. If you hike to Big Springs, your entire journey will be 10 miles round trip. 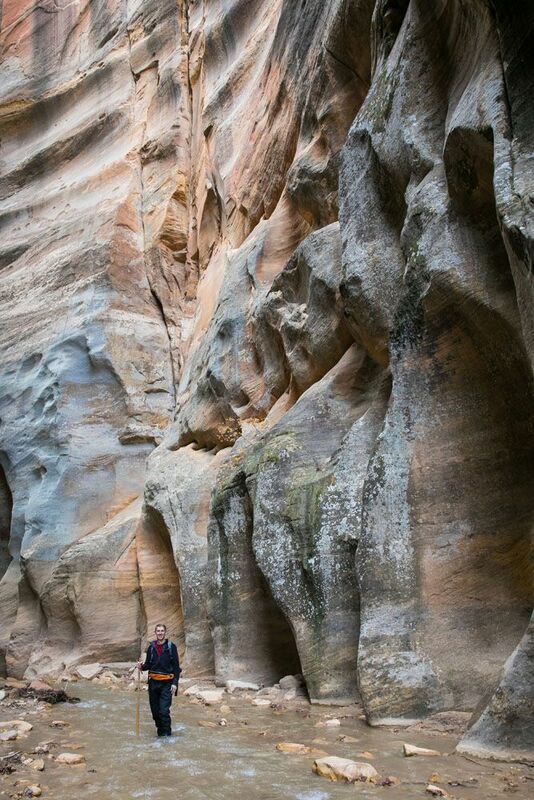 You also have the option to hike one mile into Orderville Canyon, for a total of 2 miles for this detour. 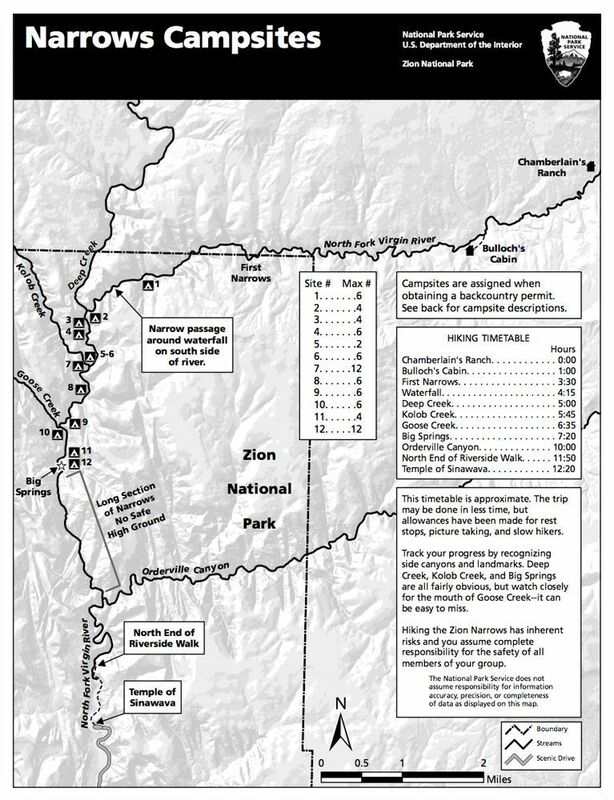 Map of the entire Narrows hike. 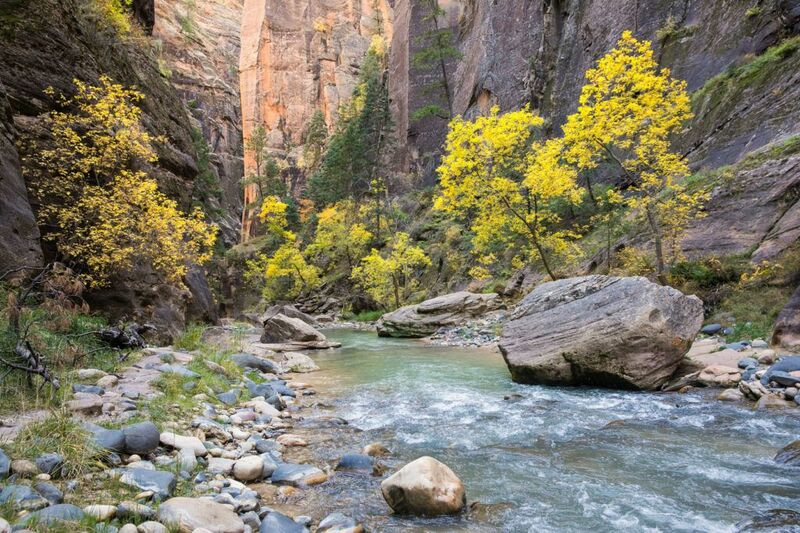 Difficulty: varies depending on the Virgin River flow rate, but overall it is easy to moderate. The most challenging section is Wall Street, where there can be sections of chest deep (or higher) water. 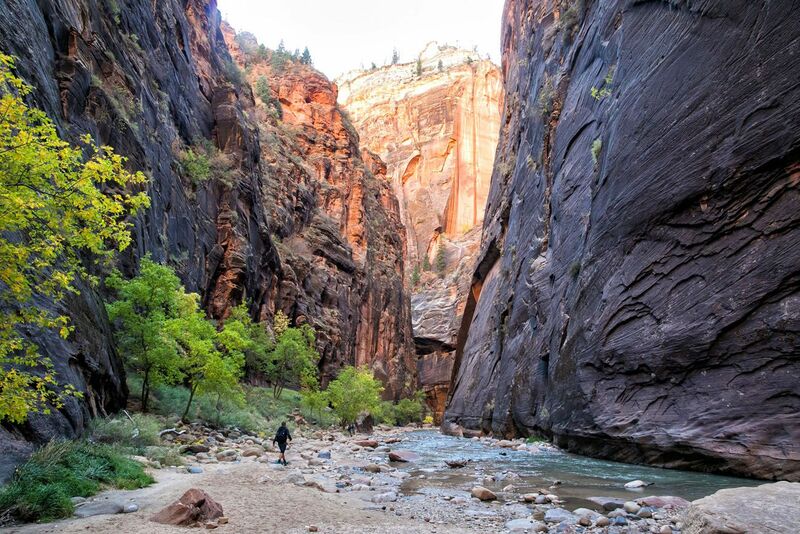 Since a permit is not necessary to hike the Narrows from the bottom-up, this trail is easily accessible to all visitors to Zion (but the downside is that this hike can get very crowded). You do not have to go far to see some gorgeous scenery. One of the prettiest sections, at least in my opinion, is just about a mile north of the Riverside Walk. Scalloped canyon walls and clusters of boulders and trees on the river’s edge all create a very scenic section of the Narrows. 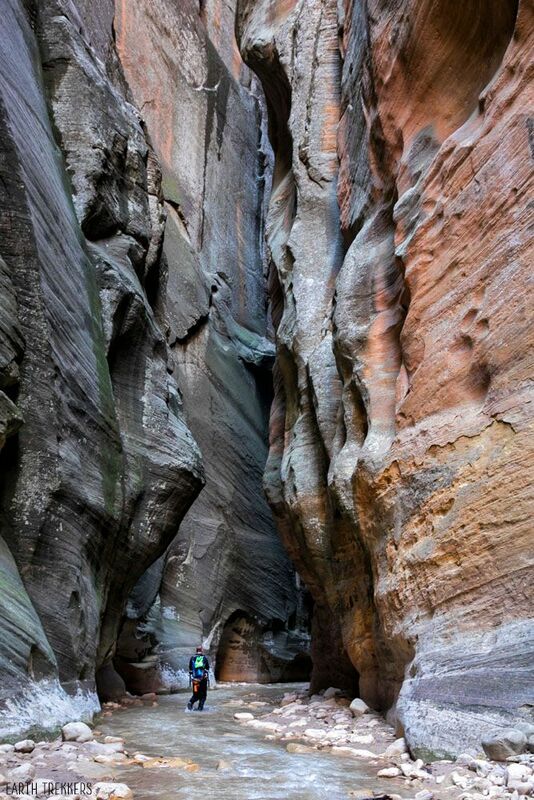 Wall Street, with its narrow canyon and colossal walls, forms one of the most thrilling and iconic sections of the Narrows. 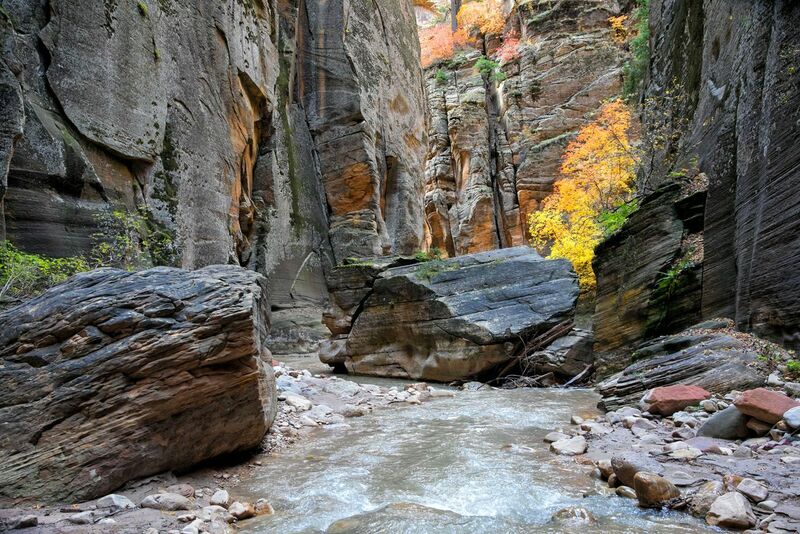 This one-mile section starts at Orderville Canyon and heads upriver through the Virgin River towards Big Springs. It is here that you see wall-to-wall water and enormous walls that hide the sun. It is not unusual to have to hike through water that is waist to chest deep. We even had two to three very short sections where the water was over our head and we had to swim. Swimming these sections made for some of our most memorable and laugh-out-loud moments of the day (even in 49°F water!). Since this is an out-and-back hike, you can turn around once you have seen enough. For some people, this hike may only be two miles long. For others, it will be 10 miles and take most of the day. The bottom-up route makes a great option if you are hiking with kids. 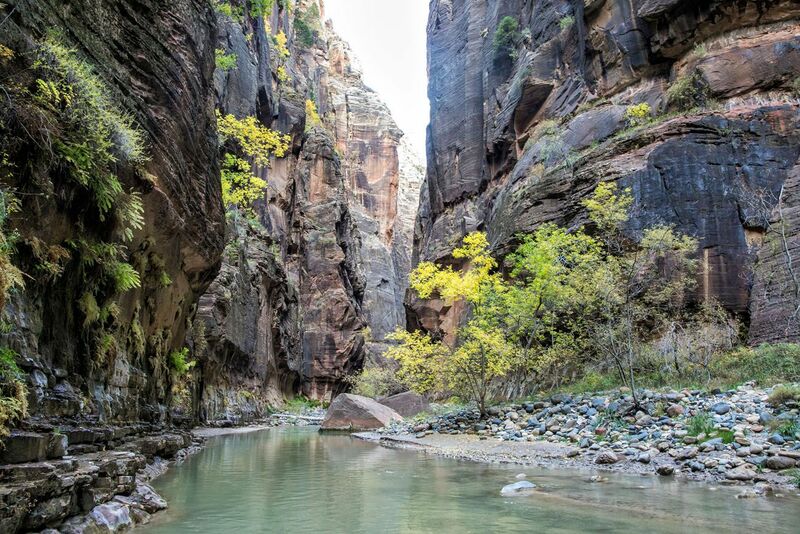 Hiking the Narrows from the bottom-up is also perfect for those people who do not think the idea of tackling a 16 mile hike sounds like fun. 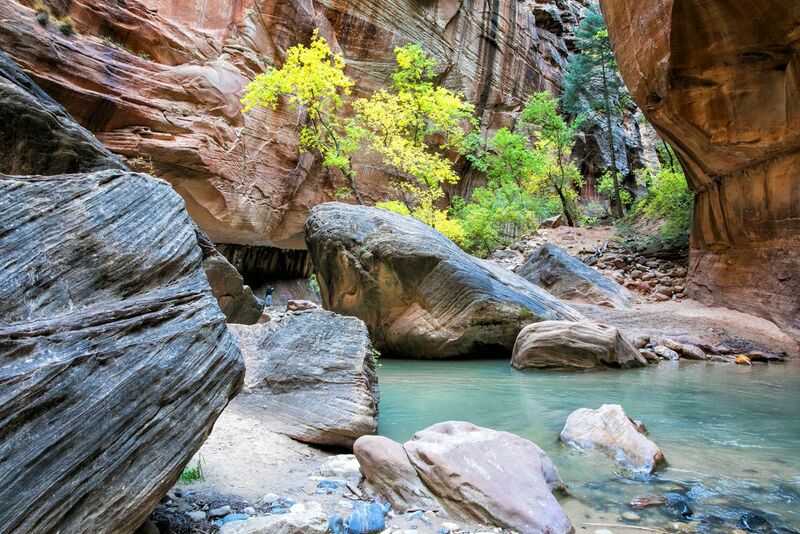 Since no permit is necessary, and since this is one of Zion’s most popular hikes, expect to share the Virgin River with a lot of hikers. Summer is the peak time to hike the Narrows and I have seen photographs of mobs of people on the trail in summer. To avoid the crowds, take the first shuttle of the day to the Temple of Sinawava or skip the summer months. Hiking the Narrows from the Top-Down is a 16-mile journey that takes you from Chamberlain’s Ranch to the Temple of Sinawava. 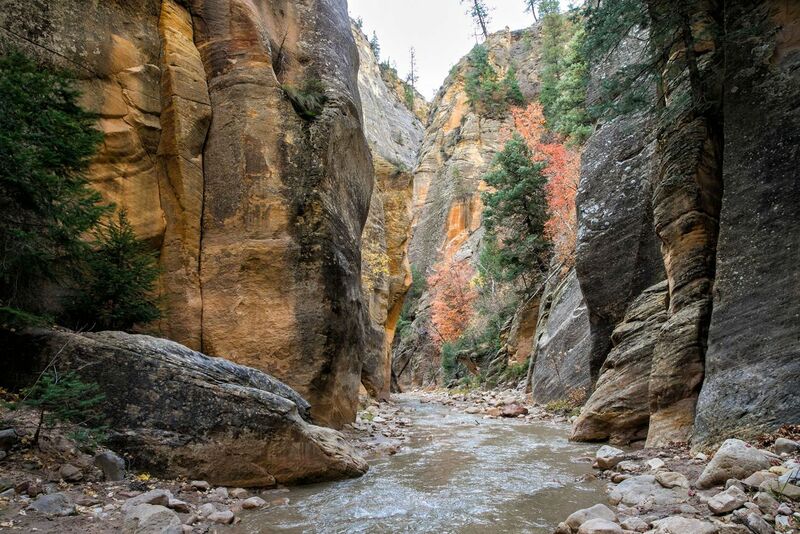 It can be done as an epic day hike or as a two-day backpacking trip. A permit is necessary for both options. Hiking the Narrows top-down in one day is no easy feat. You need to be fit and fast in order to do this. The average amount of time to hike the Narrows from the top-down is 10 to 13 hours, but it takes most people 12 hours, once you factor in time for rest breaks, photos, and meals. This is the most popular option. 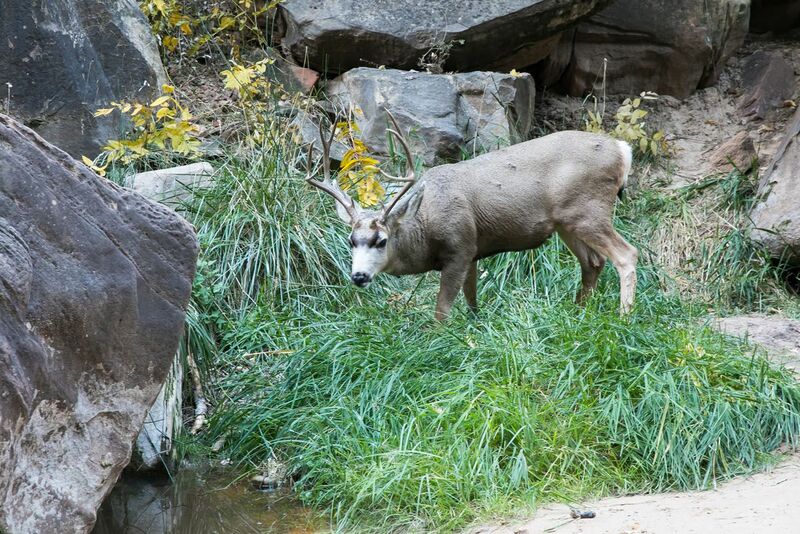 On day 1, you hike from Chamberlain’s Ranch to one of 12 campsites along the river. On day 2, you hike the rest of the way to the Temple of Sinawava. 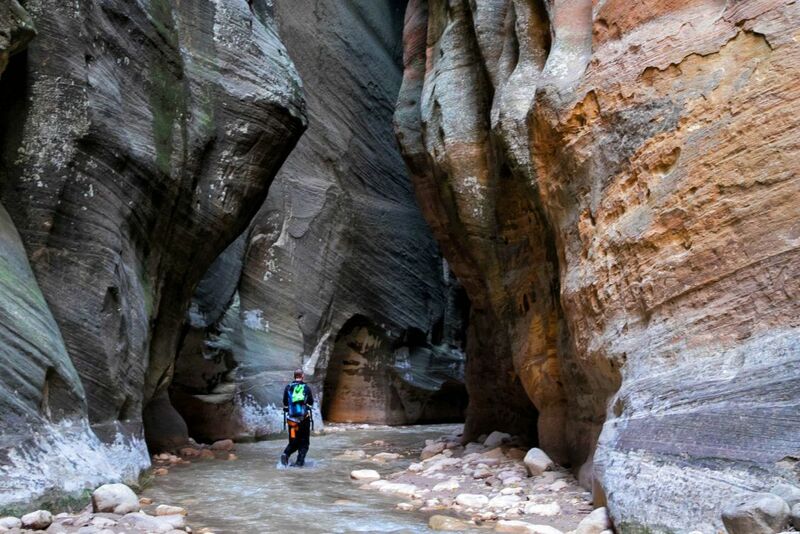 It is an awe-inspiring experience to hike the entire length of the Narrows. From Chamberlain’s Ranch, you get to watch as the canyon walls steadily grow higher in height and squeeze in around you. Walls that start off only 15 feet high eventually grow to be hundreds of feet high. 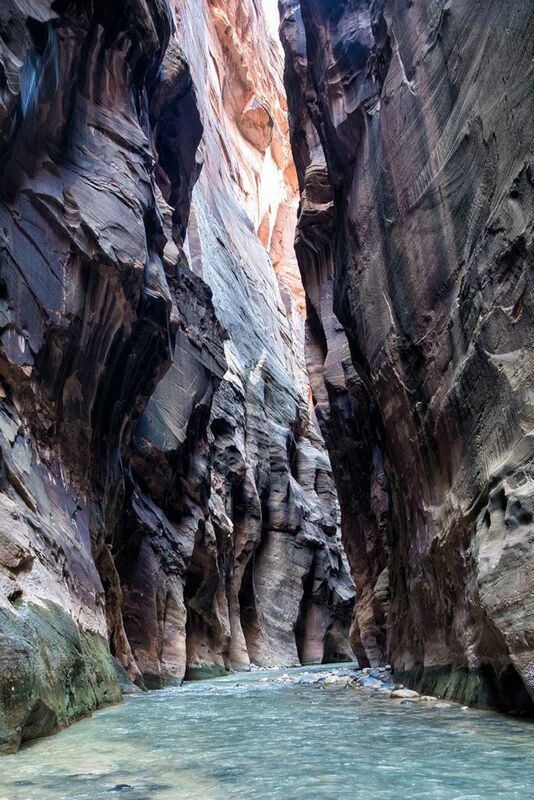 To witness the transformation of this canyon is one of the best reasons to hike the Narrows from the top-down. Since a permit is necessary to hike from the top-down, and only 40 permits are awarded per day, this is a much quieter experience than hiking from the bottom-up. Until you reach Big Springs, you will be sharing the river with just a few people, or, if you are really lucky, you could be completely on your own. Tim and I got really lucky. In late October, cold water temperatures and shorter days keep many people away. This worked in our favor and for most of the hike we were completely on our own. For us, it was worth braving the cooler temperatures for this experience. Plus, the brilliant fall colors were an added bonus. Once you reach Big Springs, you will hike in the company of many more people, especially during the summer months. Our favorite section of the entire hike was between mile 8 and 9, just before the confluence with Deep Creek. Massive canyon walls closed in around us, dwarfing us and creating an awe-inspiring experience. This very short section was more dramatic than what we later saw at Wall Street. And since we were on our own here, it was even more magical. There are permits to get, transportation to arrange, and if you are camping, extra gear to pack. Since the top-down route is a point-to-point hike, you have to arrange transportation to Chamberlain’s Ranch. This also adds an extra cost to the hike that you don’t have by going bottom-up. Hiking from the top-down from late October into the winter months becomes more challenging as the temperatures drop and the days get shorter in length. If you are spending the night in the canyon, you will need cold weather gear and be prepared for more hours of darkness than you would have in July or August. If you plan to hike it as a day trip, you need to be very fit and very fast to get to the Temple of Sinawava before the daylight runs out and the last shuttle of the day makes its pick-up. For these reasons, many people choose to hike from the bottom-up during the late fall and winter months. Top-Down vs. Bottom-Up: Which Should You Choose? Get updated information on the National Park Service website. So, which route will you choose? Comment below if you have any questions or want to share your experience. 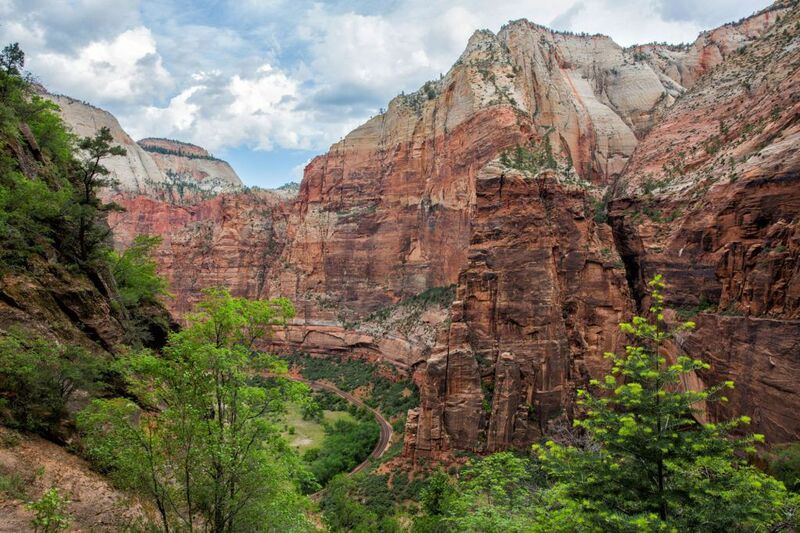 10 Great Hikes in Zion. Which One Will Be Your Favorite? 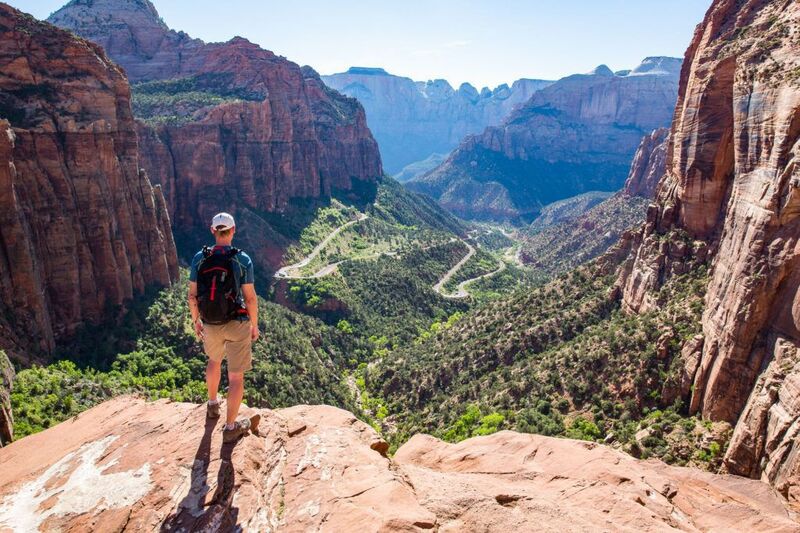 Planning a trip to Utah and Zion National Park? Read all of our articles in our Utah Destination Guide. This looks amazing! I can’t wait to do this with my children when they are a little older. This really helped me figure out which route to take.